Tone your body & give it a workout! *Choose from over 300 designs, including holiday designs! *Designs stay on up to 2 weeks on your fingernails. *Gel coating can be applied after your designs are applied! 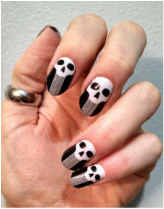 *These designs are applied to your nails by heat (not acrylic glue!) so its gentle on your nails, unlike glue used to apply fake nails. *Designs can be applied to acrylic nails or natural nails! *Phone/Text: 620-430-1636 for more info. *Ship anywhere in the United States by shopping online. *Shipping is free when ordering $40 or more online. *DODGE CITY customers can contact me to place an order if you do not want to shop online and you can make a payment with cash or I can swipe or chip-read Credit & Debit cards.